Scientists from NSIDC have spent two Antarctic field seasons studying one of the little-known megadunes areas of the continent. The NSIDC Research Team, which included Ted Scambos, Rob Bauer, and Terry Haran, worked with a team of other researchers and support staff in extreme weather conditions to gather data in one of the most remote parts of the world. 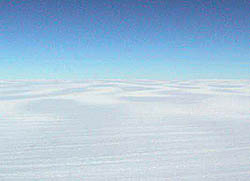 Unlike snow dunes that are piles of drifted snow, Antarctic megadunes are long, undulating waves in the surface of the ice sheet. The dunes are 2 to 4 meters (6.5 to 13 feet) high and 2 to 5 kilometers (1 to 3 miles) apart. Ted describes the dunes as "extremely gentle waves or stripes in the snow." The team conducted field research collecting snow pit samples, setting up automatic weather stations (AWS), traversing via snowmobile with ground-penetrating radar (GPR) devices, photographing various sites, and drilling shallow and deep ice cores. The first year, field work was conducted during November 2002. The second season was during December 2003 and January 2004. "Field work" on the East Antarctic Plateau may sound like a fun adventure. But imagine coming in from working in the constant freezing wind to "warm up" in a tent that is 28°F. As Ted says, "Staying warm and protecting your skin are the main concerns. Temperatures are frigid even in summer, -20 to -30°C (-5 to -22°F). But the wind is the real danger." Wind chill temperatures can reach -46°C (-51°F). Now imagine living and working in those conditions for three weeks. Megadunes camp — second season. Researchers had to keep safety in mind at all times. During the first season at the site, people could be out for two to three hours at the most, due to the extreme wind and cold. The weather during the second season was more forgiving, allowing work for up to 10 hours outdoors. The altitude was another challenge. The megadunes field site is approximately 2,896 meters (9,500 feet) above sea level. But because of the Earth's spin, atmospheric pressure in Antarctica is lower than elsewhere on the planet, making the field site seem more like 3,353 meters (11,000 feet) above sea level. Altitude sickness is always a threat. Rob Bauer was the Safety Officer, using his years of mountaineering, rescue, and emergency medical experience to keep the team out of danger. He took the pulse and oxygen absorption levels of each team member at least once a day to monitor changes. "Even people from high altitudes can suffer from altitude sickness. It's something I had to keep a constant eye on," he said. Asked if he had to perform any rescues or care for frostbite, Rob replied, "One person had cracked fingers from working in the cold. The best way to treat it is using Super Glue. It prevents further cracking and creates a hard surface," tapping his fingertips on the table to demonstrate. 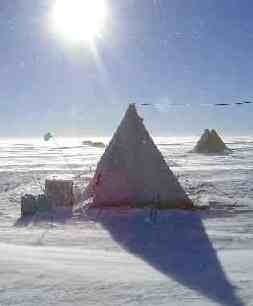 Ted added, "The two most important things to have in Antarctica are Duct tape and Super Glue." People in the field sometimes put Duct tape right on their faces to prevent frostbite. Ted speaks from experience — he had a patch of frostbite on his cheek during the first season. Photograph taken from an airplane over the megadunes. Megadunes were first noticed in scattered areas by pilots flying over other parts of East Antarctica. They saw the striped appearance of the long, low dunes. Satellite imagery showed that megadunes areas were huge areas — one area alone is the size of California. All the megadunes areas together cover approximately 500,000 square kilometers (193,000 square miles) of Antarctica, an area larger than the state of Texas. Megadunes are slightly rounded at their crests and are so subtle that a person on the ground cannot see the pattern. Even in this aerial photograph, the megadune area looks like light and dark stripes in the snow. Antarctic map, courtesy of GraphicMaps.com. There have been many Antarctic expeditions, but few have crossed this particularly remote area. The megadune fields of Antarctica provide some of the coldest and windiest working conditions on Earth. The field site is near Russia's Vostok Station, where the world's coldest temperature was recorded: -89°C (-129°F) on July 21, 1983. Explore this web site to find out how the megadunes scientist got there, how they lived, and the research they performed.